A SpaceX Falcon 9 rocket exploded in Cape Canaveral, Florida on Thursday at around 6:07am PT/9:07am ET/2:07pm GMT, destroying the rocket as well as the payload it was intended to carry to orbit. The blast was so strong, it reportedly shook buildings several miles away. The massive plumes of smoke were large enough to be picked up by weather radar. The rocket was due to launch Saturday to bring the AMOS-6 satellite into space, but it exploded during a routine rocket test. Known as a static fire test, this run-through is performed by restraining a rocket and turning on its engines. Think of it as a full dress rehearsal for launch. SpaceX initially thought the explosion was due to "an anomaly on the [launch] pad" but later clarified that a problem with the rocket's oxygen tank was to blame. In this video, you can see the oxygen tank, which is located in the upper portion of the Falcon 9, explode. The company is calling the event an anomaly, saying it "originated around the upper stage oxygen tank and occurred during propellant loading of the vehicle." "Per standard operating procedure, all personnel were clear of the pad and there were no injuries," the company's statement, posted to Twitter, continued. The explosion is a blow to SpaceX, but its impact isn't just being felt by the company attempting to privatize space travel. Facebook and NASA also have a stake in SpaceX's successes and failures, and Thursday's explosion affected the social network especially. Facebook is working with SpaceX to send a satellite into space as part of the social network's Internet.org initiative, which aims to bring connectivity to countries that don't have widely adopted internet access. 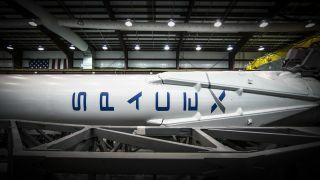 SpaceX was to provide the rocket to propel a satellite rented by Facebook into orbit this weekend. The AMOS-6 satellite is a communications probe for the Israeli satellite operator Spacecom, and Facebook leased bandwidth from French satellite company Eutalsat for Internet.org. This weekend's launch would have been Facebook's first internet-beaming satellite to make it to orbit. Facebook CEO Mark Zuckerberg, who is currently in Africa promoting the internet-delivery satellite, expressed disappointment about the Falcon 9 explosion, and the destruction of its cargo. "I'm deeply disappointed to hear that SpaceX's launch failure destroyed our satellite that would have provided connectivity to so many entrepreneurs and everyone else across the continent," wrote Zuckerberg in a statement on his wall. "We remain committed to our mission of connecting everyone, and we will keep working until everyone has the opportunities this satellite would have provided." Zuckerberg noted the social network has other internet-delivery means in the works, such as the Aquila plane, but the loss of the satellite is still significant. According to Globes, the AMOS-6 satellite reportedly cost around $200 million (about £151m, AU$265m) to build and $85 million (about £64m, AU$113m) to insure. In addition to financial impact, the explosion deals other blows as well. SpaceX, of course, is severely impacted by the rocket loss. Despite some success, the space exploration company has had a number of setbacks after another one of its Falcon 9 rockets exploded mid-flight in June 2015. That explosion was also attributed to the rocket's oxygen tank, which was ruptured by a failed support strut. SpaceX took a six month hiatus, but returned in December for a historic launch and landing of the Falcon 9. It was the first time in history that a rocket landed upright back on Earth after going as deep into space as it had. The company then followed up with another successful landing in April of this year, this time on water. SpaceX has stayed mostly quiet about its upcoming plans after the explosion, only offering brief statements. "Loss of Falcon vehicle today during propellant fill operation. Originated around upper stage oxygen tank," wrote SpaceX CEO Elon Musk in a tweet. SpaceX's official site only reiterates what it posted on Twitter. Internet.org has faced its own setbacks in the past, namely for violating net neutrality. Its Free Basics internet service was banned in India in February of this year for "discriminatory tariffs for data services on the basis of content", according to the BBC. Facebook eventually pulled Free Basics from India altogether. The explosion is yet another hurdle for Facebook to overcome in its plan to connect the world via the internet, though it has other strategies. It's currently testing its unmanned, solar-powered drone that will provide internet access to remote locations by circling an area for up to 90 days. However, the loss of an expensive satellite that would have furthered its ambitions is a blow to the company. SpaceX, meanwhile, currently still has plans to launch NASA astronauts to the International Space Station, though its planned late-2017 launch date may be delayed after Thursday's news. The company also hopes to send the world's first private spacecraft to Mars by 2018, but the explosion also casts doubts. Coincidentally, an audit conducted by the NASA Inspector General's office states the space program expects SpaceX's commercial crew program to be delayed. This will force NASA to buy six additional seats on Russian rockets, which will cost US taxpayers $490 million (about £370 million, AU$650 million).